Scientists have linked a faulty gene that causes rare tumours to autistic behaviours. Researchers led by a team at Washington University found mutations in the NF1 gene that caused neurofibromatosis type 1 also contributed to autistic behaviours in almost half of the 531 patients they studied. It’s hoped that the findings, published in the journal JAMA Psychiatry, may lead to a better understanding of the genetic roots of autism. Lead author and neurology specialist Stephanie M Morris said: “Our research indicates that this single gene also is associated with autism spectrum disorders in these same patients. Neurofibromatosis type 1 usually appears during childhood. Symptoms include flat, brown spots on the skin, tiny nodules on the iris of the eye and tumours of the optic nerve, as well as bone deformities. Children with neurofibromatosis type 1 can also have learning disabilities. The researchers at the University’s School of Medicine, in St Louis, studied patients in the United States, Belgium, the UK and Australia. 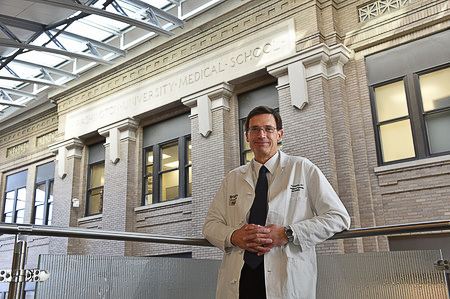 David H Gutmann, Family Professor of Neurology and director of Washington University’s Neurofibromatosis Centre, said researchers didn’t understand the link to autism in the past, but their new insights will allow them to design better treatments. The findings could also help scientists understand how mutations in a single gene can contribute to autistic symptoms such as problems with social and language skills and repetitive behaviours. John N Constantino, Professor of Psychiatry and Paediatrics, who was the study’s other senior investigator, said isolating the NF1 gene can aid efforts to learn how other, unrelated genes may interact to contribute to autism.